Based on a prototype of the LF-A being developed with an eye toward commercial release, the race vehicle, entering the Nürburg event for the second year in a row, has been equipped with race-grade safety equipment, such as a roll cage and special fuel tank, and fitted with a spoiler and other aerodynamic features. Although engine, powertrain and frame specifications differ little from those of the base vehicle, the race vehicle has been retuned to better meet the demands of the course. Last year, the supercar managed to complete 100 laps of the track, placing 48th, despite some early transmission trouble, though Lexus made it very clear the goal was not to win, but to test the prototype’s performance. No such statement has been made yet this year. Of equal importance is the fact that the Lexus press release refers to the vehicle “being developed with an eye towards commercial release”—even the entry class, Division 2 SP8 (engine close-to-production), points towards the vehicle’s upcoming release. It has also been announced that the LFA’s V10 will be pushing out at least 500 hp. The 37th 24 Hours Nürburgring, or the 37th ADAC Zurich 24h-Race 2009, will take place May 23-24th, and car sponsor Gazoo will be covering the race on their website. 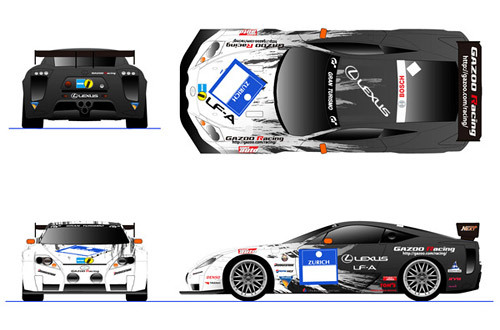 Update: It turns out that two LFAs, along with an IS-F, will be racing in the SP8 class. My mistake.